Much of my work with professionals and their offices deals with the clearing of the here and now. Often, however, I am brought in by business owners to help assist in a shift of the energy in their office brought about by changes in team members and/or business opportunities that are opening up or winding down. When I was contacted by well+done DESIGN, an Austin creative services agency, they were experiencing all of the above creating energy shifts that needed to be addressed and neutralized. 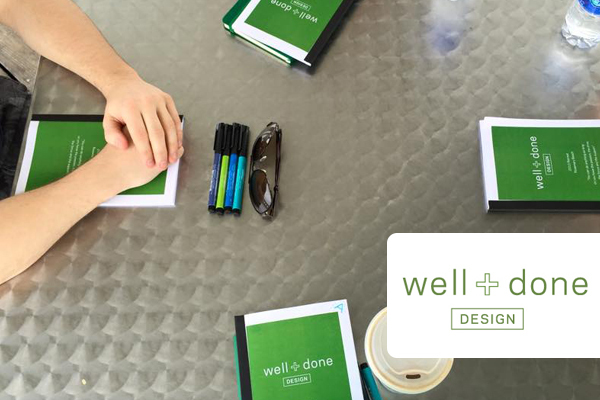 I was very excited to align with Alisa, the owner of well+done DESIGN, and her team because they were open to the change and eagerly participated in the process to uncover what was next for the company and their individual roles. With my work in Feng Shui, I started by clearing the energy that resided in the office in order to shift the energy of what they desires. I provided them the Feng Shui foundations and recalibrated the energy to support their new beginnings. The bagua or “Feng Shui Map” is deeply rooted in the elements of energy that exist in our universe. By helping people and places become more aligned with this energetic field, I am able to ensure that all are best setup for success. In the case of well+done DESIGN, I positioned the owner’s workspace in the abundance, money and power corner and within a week, her team said could she ‘sit somewhere else for a few days’ to slow down the business growth! In addition to recalibrating their energy grid to abundance, the entire team reported back that they felt more cohesive as each team member was placed in their best position to support their individual efficiency and effectiveness. They embraced every service I offer for better personal and professional growth. The on-going support has increased business, brought the current team in alignment and championed them to their best. As a service based business, they valued my gifts and how what they learned could translate to their clients.